Some of you know we moved about a year ago and we had the MOST beautiful bathroom with huge, built-in medicine cabinets. Well, for the last year my shave supplies have been in large plastic tubs on a tall shelf in a closet; and that was a real PITA. Finally hung this old shelf and while I can't get everything on it, like my razors, scuttle, my Boellis Panama Coffret, etc. At least I can see my soaps! I do need a step stool to reach the upper stratosphere. The shelf looks excellent, Primo. Looks like it’s hung in the bathroom. Did you bring the shelf with you or is it a local find? It’s an impressive array of products too. What are you doing about your razors? When my meager display area was lost for a year my gear was relocated to a chest of drawers. My daughter moved out (again), so I got my space back and I’m able to display my brushes and most of my razors. The soaps, blades and boxes remain in the drawers. Continued grooves on your new shelf! (10-06-2018, 05:28 PM)chazt Wrote: The shelf looks excellent, Primo. Looks like it’s hung in the bathroom. Did you bring the shelf with you or is it a local find? It’s an impressive array of products too. What are you doing about your razors? Thanks Charlie. The shelf was in my mother's house in Cleveland. We moved her to a retirement home in Indianapolis and I took this shelf. My long, deceased father had painted it orange. Oil base of course. Took forever to cover and the nooks and crannies!! Oy weh. My razors reside in a drawer. Blades (too many) are in a plastic container under the sink. I had another shelf and wanted to put that up too, but SWMBO put her foot down. (10-06-2018, 05:32 PM)bullgoose Wrote: Very impressive Primo! I really like your setup, Primo. I'm not sure I would want my wife to see all my shaving gear, though. I have a couple large drawers in the bathroom filled with the gear that is currently in my rotation, and the rest is stored in those large plastic tubs in my closet, but I would sure prefer your open shelves. (10-06-2018, 05:58 PM)TheLegalRazor Wrote: Very impressive indeed Primo. (10-06-2018, 06:53 PM)evnpar Wrote: I really like your setup, Primo. 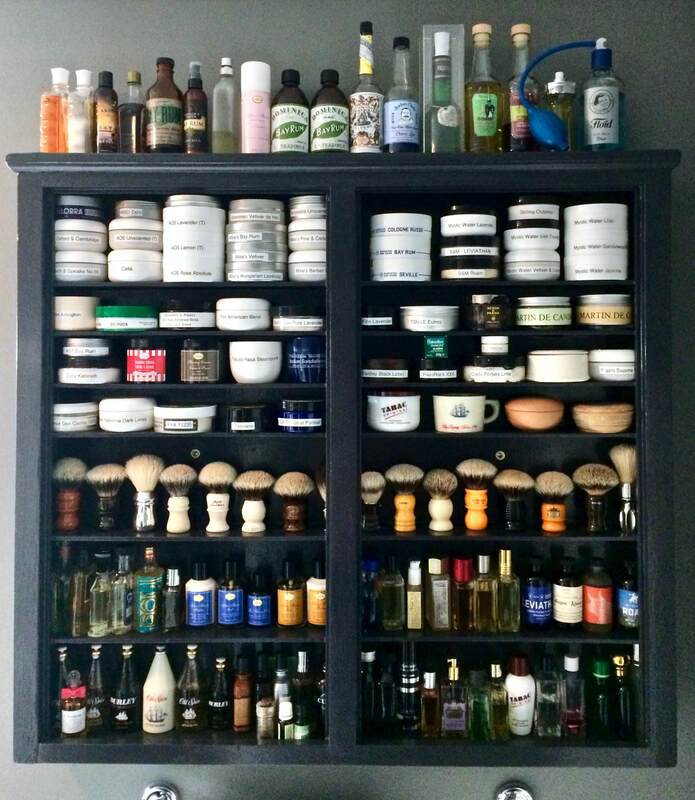 I'm not sure I would want my wife to see all my shaving gear, though. I have a couple large drawers in the bathroom filled with the gear that is currently in my rotation, and the rest is stored in those large plastic tubs in my closet, but I would sure prefer your open shelves. Thanks Richard. I took the hit, but it didn't hurt as much as I thought it would. I felt like Opie, when he finally stood up to the bully who stole his milk money. Very nice. Cleveland you say? Ah such memories I have from that city. I'll travel there in 2 weeks. I notice you like the Rum scent. Which is the most preferred on your top shelf? Thank you. Top shelf, my favorite is the Dominica Lime Bay Rum, but hidden on the bottom shelf is my very favorite: Meehan Bay Rhum. Runner-up is also hidden: Burt's Bee's Bay Rum. Thank you. I am fortunate indeed. Like the line in Crocodile Dundee, "This is a shelf"
Nice collection Primo - especially like your brushes! Waiting for our bathroom remodel next month when I can finally get a shelf. I feel your pain because most of my stuff is in boxes in the closet or basement. (10-14-2018, 07:58 AM)jackgoldman123 Wrote: Like the line in Crocodile Dundee, "This is a shelf"
(10-14-2018, 01:46 PM)Cincinnatus Wrote: Nice collection Primo - especially like your brushes! Very, very nice. I'd swear I was looking at a barbershop photo.